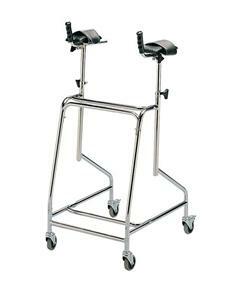 Atlas Arthritis Walking Frame Height Adjustable. 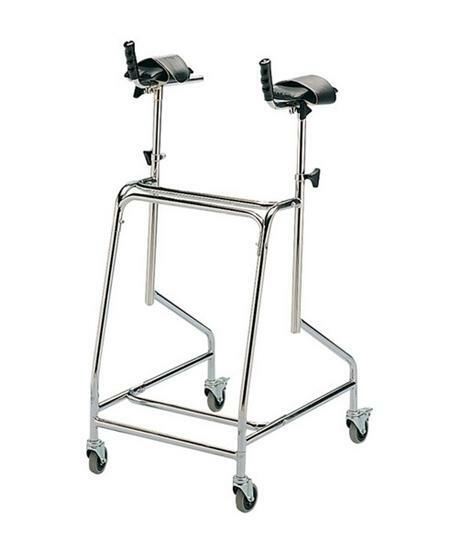 If you have painful hands, or hands with a weak grip – perhaps you suffer from arthritis – but require assistance walking, perhaps the Atlas arthritic walking frame is for you. It is a walking frame for arthritis sufferers that is basically the same as a standard walker, but it has attachments on the top instead of handgrips. When pushing the frame forward, these supports cradle your forearms and your weight is transferred through them instead of your hands. The supports are padded and are comfortable to use. The frame itself is fully height adjustable, making it suitable for all shapes and sizes, and has an easy to clean chrome plated steel frame. And with its four castors (with two brake castors at the rear), it’s as easy to control as it is supportive.